Pelé was a soccer star of the 1950s through the 1980s, beginning when he was just 17 years old and led Brazil to its first World Cup. Pelé led the team to two more championships of its five total, the most for any national team ever. He is still world-famous today as one of the greatest soccer players of all time. 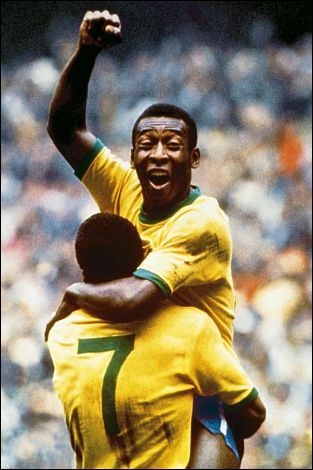 Here the joyful Pelé leaps into the arms of a teammate after making the winning goal in Brazil’s 1970 World Cup Championship. The art of football Accessed 27 August 2010.